Pretty good example of the Euston tap/Holborn Whippet chain with a great range of craft ales - plus a few real ones. We arrived when a bunch of fellas who looked like freemasons were in - so that created a bad first impression, polite though they were. Afterwards, the beers were of great quality and not as expensive as one might have feared given the location - the place is a lot cheaper than another craft beer joint in the Square Mile, the Arbitrager. I dropped by the Pelt Trader this afternoon (a Monday) when passing through the City. It's a pub I heard about a few years ago, but hadn't had the opportunity to visit. Being in the City, it's only open during the week. The pub is tucked away in the railway arches of Cannon Street station. As such, there's little light and on a hot day (like it was today), it may not be the ideal location. Nevertheless, there is a half decent selection of cask ales and some craft beers on keg too. Real ales on my visit were Bristol Beer Factory Nova, Milk Stout & Base Camp, Five Points CPA & Harvey's Olympia. The cider was Seacider Rhubarb. Keg options were from Beavertown, Kernel, Moor, Bristol Beer Factory, Five Points & Harvey's. It's £5 a pint here. So you know you're in London. Although I've paid more than that elsewhere. Certainly a decent pub to know about when in the City. But I wasn't overwhelmed. The Pelt Trader may not be the prettiest bar in tge City. Housed in an arch underneath Cannon Street tge feel is minimilist. However as a craft beer bar it has one of the best selections of beer in the City. We had a Konig pilsner and a German dark lager both well kept and at £3.80 for the pilnser fairly reasonable. The staff are young enthusiastic and jnowledgable about the beer they were serving. The pizzas they serve are tasty and reasonably priced. 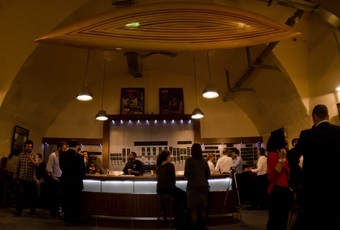 Great new (ish) pub underneath the arches of Cannon Street station. A little bit clinical in the décor and a bit light on seating but that is made up for with excellent beers - 6 Real Ales and various craft beers plus global bottles galore. A wee bit pricey but it is in the City. Well worth a visit - you won't be disappointed. Fantastic pizza, wondering beer & welcoming staff! So glad to have this pub in the square mile!